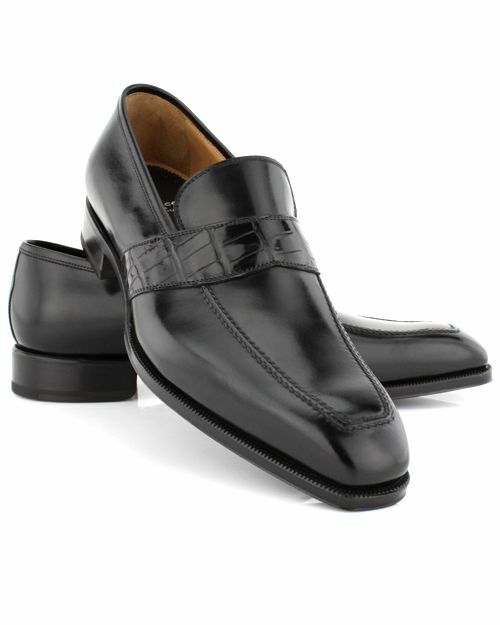 The Scarpe di Bianco men's footwear collection offers classic shoes with contemporary twists. The combination of everlasting models with fashionable colors, and updated designing with traditional details, leads to decidedly current yet elegant models. The goal of the company is to offer men a custom experience through a multitude of models, lasts, soles, leathers, and color options. 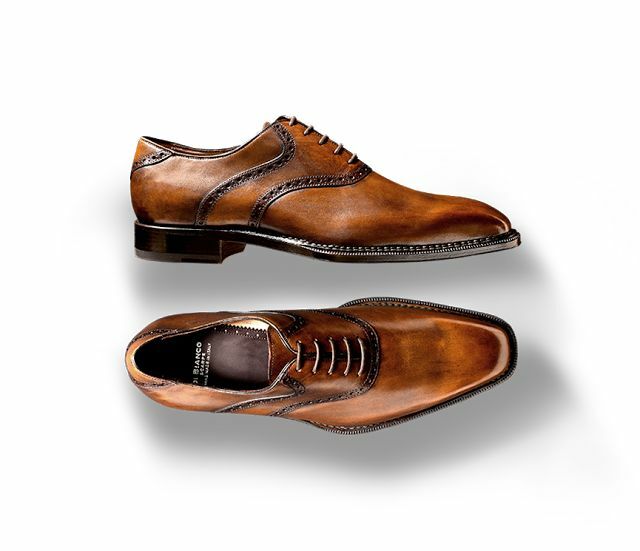 Scarpe di Bianco uses the premium materials and handmade workmanship to produce Norwegian and Goodyear welted Bench made shoes. 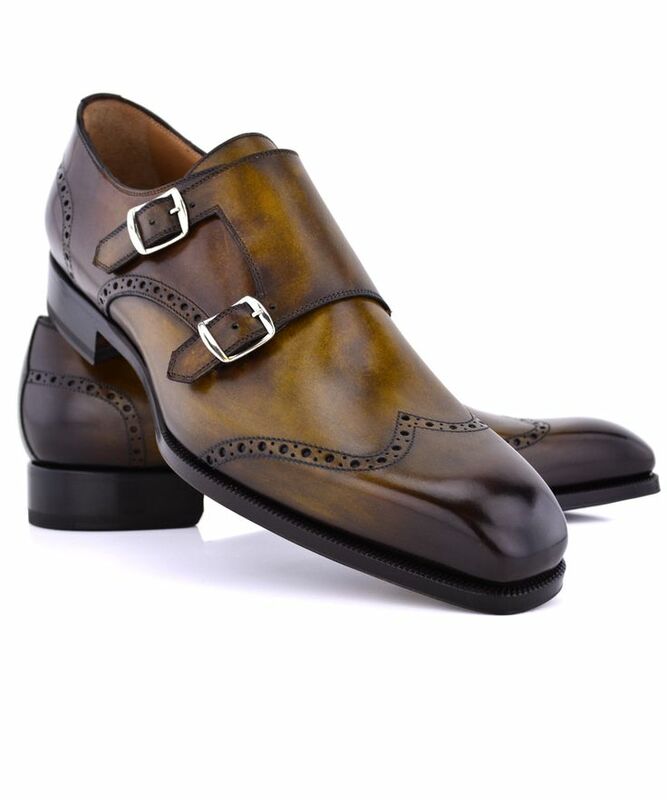 The extreme importance in detail is prominent in the rich colors and burnishes applied to the finished calf skins. The production is highly artisanal in nature witnessed by the fact that no more than 25 pairs are produced per day. Di Bianco only uses True Grain leather which is the highest rank of leather that requires no alterations. Their skins come from France and are selected from the utmost quality lots. The skins are tanned using the chrome tanning technique which results in softer and suppler leather that is very firm and more long-lasting than vegetable tanned leather. Di Bianco tricks all the leathers and linings by hand whereby we select the best place on the skins for cutting the leather pieces that will eventually form the upper. This results in a greater amount of consumption of leather per pair but guarantees that the upper is of the complete best quality and appearance. The upper is made and sewn entirely by hand. Di Bianco includes a comfortable toe liner as well as double lining inside the heel counters. Raw leather soles and heels are trimmed and beveled to reach the ideal lines and thickness as demanded by each customer. The leather is buffed and colored using non-toxic pigments. Metal tacks are used to support the toe and heels and to provide an elegant finish. Di Bianco uses the optimum polishes and colorants available in their hand polishing process. They even hand polishes black calfskin. The burnishing of Di Bianco shoes is a very long and intensive procedure that often requires the use of plentiful colors in combination to achieve the final color. Di Bianco employs champagne to enhance the burnishing effect. Several colors offered are “Based on Black” whereby the shoe begins as black calfskin but through the removal of some of the pigmentation and the hand application of additional colors the end result is a smoky multi-layered finish. At Utah Woolen Mills, we are excited to announce that we are now carrying Di Bianco shoes! Come in and check out the nice selection that we have to offer right downtown Salt Lake City.